beef broth, chicken, beef, Carrots, dried egg whites, potato starch, dried egg product, peas, Guar gum, salt, added color, Tricalcium Phosphate, dried potatoes, sodium phosphate, beet pulp, ground flaxseed, potassium chloride, natural flavor, Ferrous Sulfate, Xanthan Gum, Choline Chloride, Zinc Oxide, Vitamin E Supplement, Copper Proteinate, Sodium Selenite, Manganese Sulfate, Thiamine Mononitrate, Niacin Supplement, d-Calcium Pantothenate, Vitamin A Supplement, Riboflavin Supplement, Biotin, Vitamin B12 Supplement, Potassium Iodide, Pyridoxine Hydrocloride, Vitamin D3 Supplement, folic Acid. Feeding requirements may vary based on your dog’s age, activity level and environment. 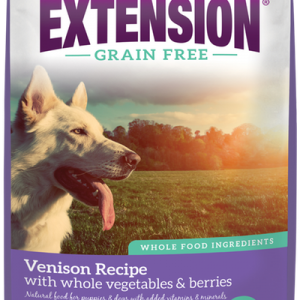 Can be fed as a complete balanced diet for your puppy or dog. 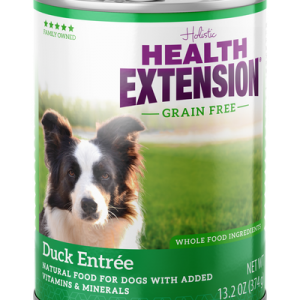 It can also be used with the Health Extension dry food to enhance the flavor and nutrition. Amount of food your dog requires will depend on activity, age, environment and breed. 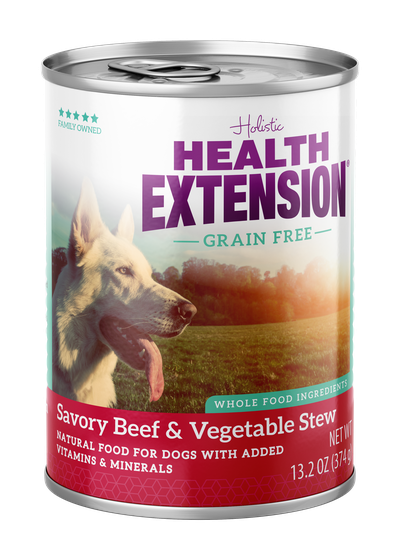 Feed 3/4 – 1 /1/4 cans per 15 lbs. of body weight per day. Feed up to twice this amount to puppies. This diet is formulated to meet the nutritional levels established by the AAFCO Dog Food Nutritional Program for all stages of a dog’s life.